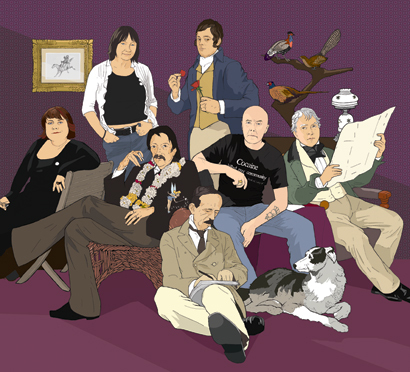 Penguin asked me to illustrate a cover for Scotland's Books - a history of Scottish literature by Robert Crawford - featuring a group of seven writers past and present: Louise Welsh, Ali Smith, R L Stevenson, J M Barrie, Robert Burns, Irvine Welsh and Sir Walter Scott. Funnily enough I was trying to draw a likeness of Ali Smith (whom I know slightly) as a sample piece recently and just couldn't crack it at all. You done good. Disappointed at the lack of A L Kennedy mind. Thanks Dave. 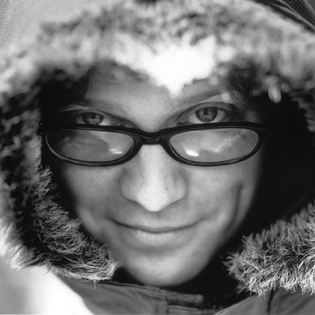 Ali Smith lives in Cambridge doesn't she? The list of authors was handed to me as part of the brief with very little time for discussion. I think it represents the most popular and internationally recognised Scottish writers, though I would have included Hugh MacDiarmid who, writing in a kind of Scots dialect, tapped into the Gaelic subconscious. MacDiarmid rejected the Celtic romanticism for which Scotland has become known, striving for a more authentic voice. My other favourites include Kathleen Jamie, George Mackay Brown, Norman McKaig, Alasdair Gray, Lewis Grassic Gibbon, Nan Shepherd, Neil Gunn, the list goes on . . .
Yup, Ali lives here in Cambridge. Raised in, I think, Dundee. Wonderful illustration, and I understand why MacDiarmid should be included, in terms of influence, but I don't really think he deserves all the credit you give him! I'd like to see a bit of Liz Lochhead, John McGrath, James Hogg, Muriel Spark (although I know people would probably object) and most importantly...Edwin Morgan! Surely Glasgow's city poet deserves a place in that line up! John McGrath is an interesting candidate because although he wrote a series of plays about Scotland's history and struggles he was of course English and moved between north and south. In my opinion the underlying message of The Cheviot, the Stag and the Black, Black Oil is socialist rather than nationalist. I've always found it curious that an Englishman (born in the same town as myself) did so much to heighten awareness of the nationalist cause.